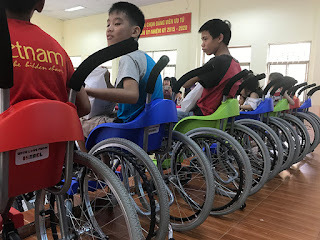 From the children of Israel to the children of Vietnam: Israel’s Embassy in Vietnam is donating 100 innovative wheelchairs especially designed for children with disabilities. In a moving ceremony held at the Orthopedic and Functional Rehabilitation Center in Hanoi, Israeli Ambassador to Vietnam, Meirav Eilon Shahar, presented the first 20 wheelchairs to a festive crowd, sending a message of solidarity and friendship. The remaining 80 wheelchairs will be delivered to additional rehabilitation centers in four provinces in Vietnam: Ho Chi Minh, Can Tho, Ben Tre and Ha Giang. Wheelchairs of Hope is an Israeli initiative that aims to develop, design, manufacture and provide wheelchairs to children in need of mobility. They were among the first to receive the Grand Challenges Israel (GCI) grant, dedicated to supporting technological and innovative solutions to challenges in global health and food security in developing countries. GCI is operated by the Office of the Chief Scientist Ministry of Economy in collaboration with MASHAV as part of commitment to share its knowledge and experience to inspire and support fellow nations in their struggle with development challenges, and constitutes a meeting point between Israeli development diplomacy and technological entrepreneurship. Israelis shared their agricultural expertise with Palestinian farmers seeking to improve their avocado crops. A group of Palestinian agronomists and agricultural engineers recently completed training in avocado cultivation at the Galilee International Management Institute (GIMI) in Nahalal, northern Israel. The purpose of the training was to improve the Palestinians’ avocado crop. Participants toured the avocado plantations in the north and met with Israeli avocado farmers. The Palestinians came from the areas of Hebron, Qalqiliya, Tubas and Jenin, and some already grow avocados for export to Arab countries. During the training, the Palestinians expressed a desire to cooperate with Israeli growers to enable the export of “Palestinian avocados” to Europe. Israel avocado exports to Europe have grown to roughly 100,000 tons in recent years, comprising about a third of the winter avocado market in European Union countries. About 40 percent of the participants were women, most of them agricultural entrepreneurs with a particular interest in avocado growing. Prof. Yair Hirshfeld, one of the initiators of the Oslo Peace Accords, lectured during the program on possibilities for cooperation in agriculture and their implications for the peace process between Israel and the Palestinians. The program was sponsored via combined funding from The Middle East and the Peace Process Department at the Israeli Foreign Ministry, in cooperation with the European Union through the agency of Economic Cooperation Foundation and GIMI. This week UN Secretary General Antonio Guterres is conducting his first visit to Israel since his appointment. While in Israel the Secretary General will meet with PM Netanyahu, Defense Minister Liberman and senior figures from the IDF, as well as President Rivlin. · Israel sees this visit as a welcome opportunity for a new beginning in relations with the world body, and welcome the Secretary General as a friend. · The UN's and its agencies' obsessive pre-occupation with Israel must end if the world body is to make a constructive contribution to peace and stability in the region. o The annual circus of anti-Israel resolutions in the General Assembly and the permanent committees they create. o The discriminatory anti-Israel activities of different U.N. bodies and their "industry" of reports, declarations and decisions. Further the Security Council must act more resolutely to implement its resolutions forbidding Hezbollah rearmament and entrenchment in southern Lebanon. The Security Council must act to prevent a deterioration of the already dangerous situation. The UN must act to stop the ongoing Palestinian encouragement of terror against Israeli civilians - online, through the payment of stipends to convicted terrorists and their families, through naming town squares after murderers. These fundamental obstacles to any kind of progress with the Palestinians. o in cyber-security, water technologies, women's' empowerment, disabled rights, combatting desertification, and more. Israel is also a partner in the global effort to combat terror. The influx of Chinese students at Israeli universities has been growing steadily in recent years. On the forefront of this enrollment boom is the University of Haifa, which currently boasts some 200 Chinese students among its student body, compared to 20 in 2013, representing a 1,000% increase. A majority of these students come from the University of East China Normal University in Shanghai, which is a sister city of Haifa. These ties can result in profitable research and development in which millions of dollars are currently being invested in the hopes to further strengthen the bonds between the two countries. This past March, Prime Minister Benjamin Netanyahu and Economy Minister Eli Cohen were present when Robin, along with the Hangzhou Wahaha Group and the Institute of Automation at the Chinese Academy of Sciences, signed a $10-million deal that finalized the construction of three Israeli-Chinese artificial intelligence technology centers in Haifa, Hangzhou and Beijing. Across town, the Technion-Israel Institute of Technology has also seen an influx of Chinese students in recent years. During the 2016-2017 academic year, the school had 117 full-time Chinese students, and 177 Chinese students enrolled in its summer school of engineering. The Technion has been intensifying its academic cooperation with Chinese universities and students, and in 2013, together with Shantou University (STU), received a $130m. grant from the Li Ka Shing Foundation to establish a branch of the Technion in the Guangdong Province. The highly anticipated addition to the Technion is scheduled to open its doors in October. Some 240 students from several provinces in China have enrolled for study at the Technion branch, which offers three engineering programs: chemical, material science and biotechnology and food engineering. Preparatory studies begin this month and the first semester begins in October. In a recent MEMRI report 22 August, and following the passage of legislation in the U.S. Senate suspending aid to the Palestinian Authority (PA) because of the PA's extensive support for Palestinian prisoners and the families of Palestinian "martyrs" and wounded, it is being claimed in the PA that the payments and aid given to the prisoners and the families of martyrs are the same as welfare benefits given to needy families. This argument is based on the reasoning that in both cases, the family wage earner cannot work and the family is reliant on aid. As usual the Palestinian terrorist bullies are threatening the world with diplomatic warfare if the US does not give in to their demands. Anything except sitting down to negotiate in good faith. The Palestinian ultimatum states that unless progress is made within 45 days on launching talks with the Israelis, the Palestinians will consider themselves no longer committed to the US mediation and will turn to an alternative plan to push for unilateral United Nations recognition of a Palestinian state. Abbas is demanding that Trump publicly declare that the US regards the two-state solution as the only solution and that he insist that Israel “stop creating facts on the ground” through construction in Jerusalem, Judea and Samaria. Trump has said he would accept any solution that would resolve the conflict. “I like the one that both parties like,” he said in February, at a joint press conference with Prime Minister Benjamin Netanyahu in Washington. “If we don’t hear within a month and a half that the American team has stopped talking and started doing, Abbas intends to mobilize anyone and everyone he can for the UN General Assembly session on the establishment of a Palestinian state, regardless of the Israeli and American reactions,” the official told Al-Monitor. Abbas expressed frustration with the US on Sunday, saying he had met with the American representatives 20 times since Trump took office in January but still had no clear vision of what peace plan they had in mind. “I don’t understand their conduct toward us, as inside his country the administration is in chaos,” Abbas was quoted as saying. The Palestinian official who spoke with Al-Monitor said that even though the PA’s belligerent course of action could result in serious damage to its relationship with Washington, these were not empty threats and the ultimatum to the US had been carefully considered. Over the past two years, more than 53 countries have suffered from damage caused by terrorism. The current wave of terrorism in Israel and the West Bank, as well as the wave of terrorism that has gripped Europe this past year, have received such extensive media coverage that viewers might be led to believe that this violence has sprung up from within a sea of calm. The reality, of course, is nothing of the sort, and it’s important for us to know where we’re headed. Every year, the Institute for Economics and Peace publishes the Global Terrorism Index, which tracks acts of terrorism that take place around the world, and data from indices published in previous years leave little room for doubt. The number of people killed as a result of terrorist attacks rose 80% in 2014 compared with the previous year and stood at 32,000 – an all-time record. This record high figure remained constant during 2015 and 2016, which turned out to be just as violent, even though they had a slightly lower number of total victims. This violence was mainly due to the intensification of fighting against ISIS in Western countries. Over the past two years, more than 53 countries have suffered from damage caused by terrorism. The countries that were the most affected were, not surprisingly: Afghanistan, Iraq, Syria, Nigeria and Pakistan. In Europe, dozens of countries suffered from terrorist attacks in the past two years. Thirty-four of them experienced isolated incidents, but the number of casualties went up by hundreds of percentage points from previous years. According to the 2014 Index, the damage to the world economy caused by terrorist attacks amounted to $53 billion, 10 times the amount caused in the year 2000. In 2015, this amount rose to $89b. and it is still steadily rising. More than one-third of the victims of terrorism are Muslim, and most of the attacks are carried out in Muslim countries. Whereas most attacks that didn’t take place in Muslim countries took place in Eastern Asia and South America, the most recent Index shows an increase in attacks taking place in Europe. Even in Israel and in Palestinian Authority territory, most attacks were inspired by ISIS and other global jihad organizations. Hamas will continue to strengthen its hold on the Gaza Strip and prepare itself for the next battle with the IDF, which will take place at a time to be determined by Hamas alone. Hezbollah is busy fighting against ISIS in Syria, and so does not currently pose much of a threat to Israel’s northern border. ISIS has suffered severe and debilitating defeats in the last few months of fighting, and yet has still managed to carry out a few isolated terrorist attacks in European countries. This trend is expected to continue, especially since Turkey’s eastern border allows for relatively free and easy passage for ISIS militants making their way to the West. Many Eastern European fighters who went to Iraq to fight for ISIS have now returned home and are actively carrying out attacks in their home countries. Iran has the interest and the funds to finance terrorist organizations, but apart from Hezbollah, all the other terrorist groups in the Middle East are Sunni, and so Shi’ite Iran would not be willing to offer them support. So what is Islam and how dangerous of a threat does it pose to the world? Islamist terrorist organizations number about 100,000 armed fighters, most of whom are located in the Middle East, Africa and Asia. There are another few hundred thousand people who support these organizations. The Muslim world numbers more than 1.5 billion people. Less than 0.01% of them are actively involved in terrorist activity and less than 0.1% support these organizations. And at the most, 10% of all Muslims support the religious struggle for the destruction of all other religions and the establishment of a Muslim caliphate over the face of the earth. So how is it possible that such a small percentage of our planet’s population can sow fear in all of us? The answer can be found here. Western countries, led by the USA and European countries, deluded themselves that Islamist terrorism would remain in Africa and Asia and would not find its way to their doorstep. They didn’t learn the lessons from the past, and didn’t internalize the fact that without treating the root of the problem, it would be impossible to stop the spread of terrorism. US President Trump is showing initial signs of willingness to put up a good fight against terrorism, but European countries are still lagging behind. If the EU is serious about preventing the escalation of terrorism in Europe, it must carry out a number of measures: Identify and map dangerous population centers; make legislative changes that would enable the authorities to carry out counterterrorism activity; carry out law enforcement; form an intelligence gathering network; have counterterrorism departments collaborate; and understand the difference between an organized jihadist Islamist network and lone wolf attacks. Western countries – especially Israel – must understand that we cannot ignore terrorism. Instead, we must fight against it with all the force, determination and courage we can muster. We cannot let our guard down even for a moment, and must use all the legislative and legal powers we possess. Empty threats and press conferences, talk about humanism and shelling empty plots of land won’t help at all – they will only perpetuate our struggle and encourage the continuation of terrorism. Even if terrorism does not constitute an existential threat to the planet, it’s time to change the rules of the game and start fighting a real war against it. “Our mission is to tackle the biggest problems in cybersecurity and give organizations the advantage over cyber attackers." Expanding its involvement in Israel’s growing cybersecurity sector, Intel on Wednesday announced new collaborations with two Tel Aviv-based firms. The US chip giant will be partnering with Team8, a cybersecurity think tank that helps launch cyber start-ups and serves as a platform for research initiatives. In addition, Intel will be joining hands with Illusive Networks to develop a solution for combating advanced persistent threats – network attacks by unauthorized sources in which data is generally stolen – by harnessing hardware and software competencies simultaneously. The Intel-Team8 collaboration will involve an exchange of information regarding cyber threats, with a goal of developing solutions that are able to respond to both current and future risks, the partners said. Run by veterans of the IDF’s 8200 intelligence unit, Team8 is a self-described “cyber powerhouse” that works together with innovators to help create disruptive, industry-leading cybersecurity companies. Intel will be joining current Team8 syndicate members – including Microsoft, Cisco, Qualcomm, AT&T, Citigroup, Accenture, Nokia, Temasek, Mitsui, Bessemer Venture Partners, Eric Schmidt’s Innovation Endeavors and Marker LLC – which work closely with Team8 during company creation processes. As far as the partnership with Illusive Networks is concerned, Intel and Illusive will be working to extend deception-based cybersecurity from software to hardware, by diverting attack commands from potential targets and frustrating further progress, the companies said. Real-time alerts will also provide customers with contextual forensics, in order to neutralize threats in their early stages, the firms added. Also on Wednesday, Intel announced its intentions to expand its Israeli Cyber Security Center of Excellence, managed by serial cyber entrepreneur Jacob Mendel. At the center, Intel is employing a number of cybersecurity researchers who are developing advanced techniques to help the company harden its products against attacks, the company said. Here is a guest blog written by the commander of the IDF's Operation Good Neighbour, which provides humanitarian aid to Syrians harmed in their country's bloody civil war. The IDF prohibits the naming of his identity. I remember the beginning of Operation Good Neighbor as if it were yesterday. The truth is that we had serious doubts about whether it would really happen — whether the Syrians would actually arrive. Then, at 3:00 am in the freezing cold of the Golan Heights, we noticed them walking along the fence. Twenty-five children holding their mothers’ hands passed through the gates in what seemed like a modern Exodus. The phrase “The Syrians are at the border” took on new meaning. You could see the suspicion in their eyes. Tired and barefoot in the darkness, they met IDF soldiers for the very first time, we who had been so demonized by their culture. After many conversations with quite a few Syrians, I have come to realize that it’s no myth: up until the day they received our help, many Syrians genuinely believed IDF soldiers had horns and tails. It was surreal to see a mother holding her little daughter’s hands, almost collapsing from weakness. Instinctively, one of the Golani soldiers on the scene noticed the woman stumble and leapt towards her, gathering the child up in his arms. Suddenly, it seemed the border had disappeared: it was a human moment shared between people, a moment of distress on the one hand and of compassion on the other. A moment I will never forget. Since then, we have come a long way. That operation marked the beginning of an intensive period of humanitarian activity. Every day and every night, 24/7, we operated a system that did only good. We provided flour, baby food, medical supplies and medicine in huge quantities, and that was only the beginning. Across the border there is a civil war – the cruelest of its kind — and our job was to make history and be remembered as the ones who did the right thing. Today, with the perspective I have gained from nearly a year, I realize that that very first moment at the fence was historic. A moment, I hope, that will be engraved in our memory – a moment of Israeli pride and Jewish compassion. Before all else, I always remember that my mission is to ensure security – to create good neighborly relations on both sides of the border – and we do this, perhaps, in the most noble way possible. It is a great privilege to command a unit with this mission, in this place and at this time. We have been given the opportunity to reshape reality, and with a lot of motivation and good people I believe we will continue to do our very best. Over the past year I can count dozens of meaningful moments, but one has become engraved in my memory, and I think there is nothing more appropriate to describe the activity of being a “good neighbor.” A week into the winter, during a severe rainstorm, we decided, at the request of the Syrians, to go forward with a plan to take in sick children although the harsh weather dictated otherwise. At the end of the activity, I found myself standing with the Syrian doctor, the operation’s civil liaison in one of the villages in the area. The two of us, soaking wet, looked at each other and laughed. “I told you it would be difficult,” I told him. A number of European governments have joined the US in demanding that the Palestinian Authority (PA) end its policyof paying salaries to Palestinian prisoners convicted of terror crimes. The monthly stipends are incitement toterrorism, while the PA claims that they are “welfare”payments. In reality, a number of Palestinian non-governmental organizations (NGOs) that receive European government funding under the banner of “human rights” assert that terrorists have a “right” to receive salaries and that suspending these payments is a violation of international law. NGO officials also have not questioned the legitimacy of violent responses by the Palestinian street, and some of their statements can be interpreted as veiled threats of violence meant to prevent an end to payments, said NGO Monitor, an independent research institution that monitors other NGOs claiming to fight for human rights but which in fact assault Israel. A Violation of Human Rights? In the 1980s, Sourani was convicted for his membership in the Popular Front for the Liberation of Palestine (PFLP) terrorist group. All these NGO’s are heavily funded by European countries. The Temple, sited on the Temple Mount, the one that the Arab Muslims deny ever existed. The one on whose ancient site on Temple Mount Jews are barred from praying in case this is used as a pretext by the Arab and Muslim world to start World War Three. The one which the Arab Muslims have turned into a battleground. The Arab Muslims claim there never was a Jewish Temple there. Their denial that the land of Israel was ever the Jewish homeland is centred on their claim that there never was a Temple in Jerusalem, only the al Aqsa mosque. Yet when illegally excavating an area for another mosque on the site they disposed of tons of earth containing artefacts proving the existence of the temple.They wanted to conceal this because their war of extermination against Israel is based on the lie that the Muslims are the original inhabitants of the land. But they have not succeeded. What the fast of Tisha b’Av itself also tells the world is that the Jews were in Jerusalem before the Babylonians, before the Romans, before the Christians and most certainly before the Muslims. What Jews mourn on Tisha b’Av is an actual historical event. And, states Melanie, “that’s what so many in the west also don’t grasp – that the Jews alone are the indigenous people of the land, and that Judaism is based on an actual nation which practised its religion in the actual historic kingdom of Judea”. “But because Islam holds that any territory ever occupied by Muslims remains Muslim for ever and can be ruled by no-one else, the Muslim world will not accept this. That’s why the war over Temple Mount is not being waged in the name of the Palestinians or even the Arabs but – according to Mahmoud Abbas amongst others – all Muslims”. Tisha b’Av is day of mourning and it’s still relevant today. For those wanting to destroy us are still with us, the Temple Mount is still occupied and the stones are still being hurled down from it. The only difference is that instead of the Romans, today it is Arab Muslims.